The Crowne Plaza London Ealing has been transformed during its #6 million upgrade and offers a contemporary and stylish venue with tastefully designed surroundings and state of the art facilities. 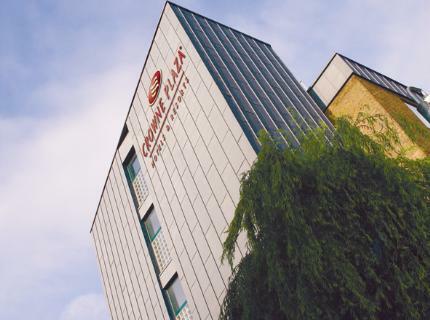 The Crowne Plaza London Ealing is ideally located on the Hanger Lane Gyratory System close to Wembley (3 miles) and Heathrow Airport (12 miles) and with easy access to Central London by car or public transport. The hotel is also directly next to Hanger Lane Tube Station, on the Central Line of London's Underground. The hotel is also walking distance from Park Royal leisure park with restuarants and cinema. Five floors with 131 guest rooms, of which all are now refurbished. All rooms offer individually controlled air-conditioning as well as private facilities including tea/coffee making, trousers press, hair dryer, direct dial telephone, satellite TV, in house movies, wireless Internet connection, triple glazed and 24-hour room service. We wish to apologise for any disruption caused to our guests during the refurbishment work. The upgrading of the hotel has included works to all areas including bedrooms, restaurant, bar, conference rooms, health club, club lounge and all public areas. The refurbishment work does heavily restrict the amount of car parking spaces and we are limited to 35 spaces at the hotel for guests® vehicles until August 2008.